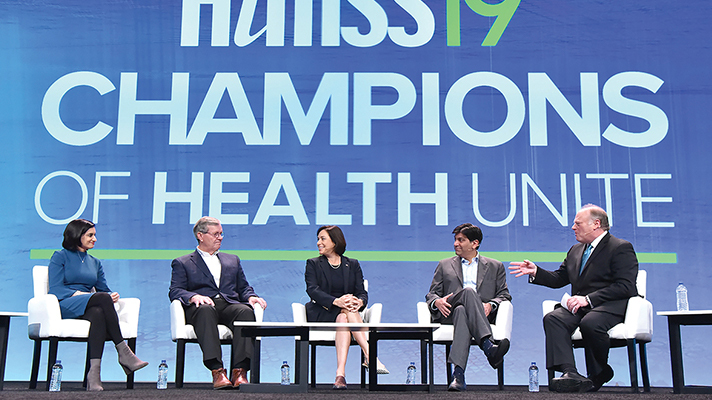 ORLANDO – HIMSS CEO Hal Wolf of Tuesday outlined the most pressing challenges healthcare in America and other countries face today. Those are an aging population, the chronic disease burden, geographic displacement, a lack of actionable information, challenged funding systems, increasingly demanding consumers and growing staff shortages. Wolf cut to the chase asking CMS Administrator Seema Verma about the HHS information-blocking proposed rule that arrived yesterday. Michael Leavitt, who served as both Secretary of Health and Human Services and Utah Governor, said the CMS proposed rule is a moment for healthcare to collectively move forward with a leap that is more than incremental. Former national coordinator Dr. Karen DeSalvo said this is an exciting time because the industry is not just talking about getting data in and out of EHRs anymore and, instead, looking at how consumers are going to drive this shift to new models of care. Toward data interoperability, Verma added that CMS also gave a nod to FHIR in its proposed rule because agreeing on one standard can lower costs and give patients more access to their health information.